I’m sure most of you have noticed, but if you ever get into any sort of debate or online conversation, you’re going to come across loads of overconfident “know-it-alls”. For example, it can be unbearable watching a Youtube video online and then reading through the comments below. If you actually do deeply understand the subject matter being discussed, such as me when it comes to physics and science, you’ll realize that most of these commenters have no idea what they’re talking about. Yet that doesn’t seem to stop them from screaming their erroneous ideas and beliefs at everyone else, causing fights, name calling, and being nasty to one another. Why is this? 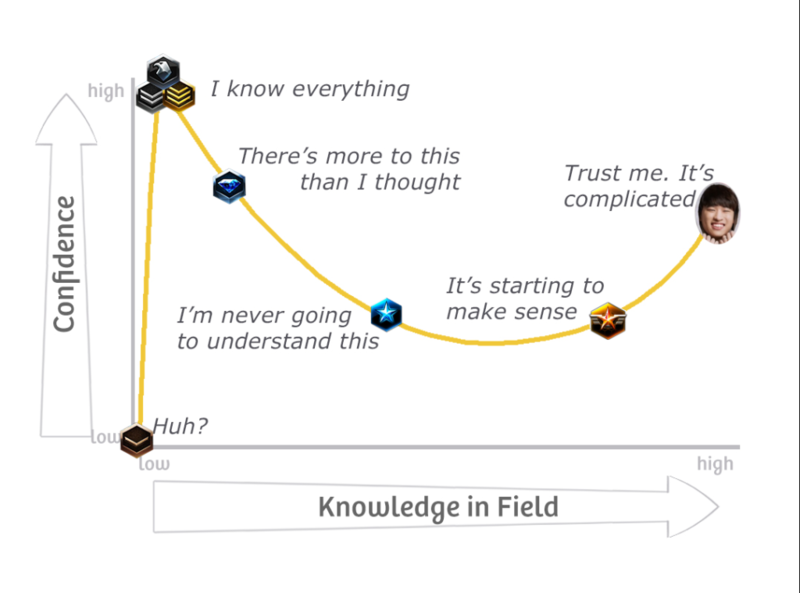 To understand what’s going on, the key psychological dynamic to understand is what’s called the Dunning-Kruger effect. It’s summed up in this chart. Human nature is strange in that the less a person knows about something, the more confident they are about the subject matter. In the beginning, they may not know anything about the subject, and that’s about the only time you can trust a typical person. You’ll ask them about the Affordable Care Act and they’ll say, “Huh? What is that?” Great, an honest, reliable response. But then something interesting happens. The person reads one or two news articles, probably from an extremely biased source, and then all of the sudden they are an expert. At least that’s how they fell. They have a false confidence that they know and understand all that there is to know and feel compelled to broadcast this expertise to everyone. If you disagree, they call you stupid, a moron, an idiot. They’re combative and full of this amazing confidence. Psychologists tell us that nobody is as confident as a person who dabbles a little in some subject area, not even true experts with PhDs in the subject. This is what you are encountering in almost all internet discussions. People know just enough to have an opinion, but not enough to actually deeply understand anything. Essentially you have a bunch of blind know-it-alls, who don’t even realize how little they actually know, all fighting with one another about things they haven’t a clue about. But then something happens. If a person has enough drive, they’ll dig into this issue even deeper. Say they’re really interested in politics and start digging into the Affordable Care Act. That’s when they realize, uh oh, there’s more to this than I initially thought! Their infallible confidence begins to wane. Then they continue to dig, more and more, and that’s when they realize, wow, I had no idea what I was talking about! I don’t understand this at all. Horray, they’ve became self-aware! Now their confidence is where it should be, at an all time low. So now the person continues to research this area. Maybe they even go to college and work to earn a degree in economics. After maybe earning their bachelor’s degree, they start to think to themselves, you know, this is starting to make sense. However, their confidence is still pretty low because now they’ve learned how complicated it all is. They now know what they don’t know, and are aware of what they actually do know. The confidence that they have is justified. If they now decided to master in healthcare economics and earn their PhD, after six to eight years of dedicated research into this one area alone, then their knowledge is at an all time high, however, even then, their confidence is still lower than that of the dabbler who has only read one small biased news article. So here’s what happens in practice. Those who don’t know anything are also the most vocal. These are the majority of commenters on the internet. Those who actually do know what they’re talking about are few and far between, and because they understand all the difficulties and subtleties involved, they are very careful to make definite statements one way or the other. They know what they know, but they also know what they don’t know, so they are careful with what they say. So the end result? The internet is flooded with the opinions and discussions of people who don’t have a clue. This isn’t to criticize anyone. When I was younger, just getting out of high school, that’s when I began blogging and writing a journal. I felt compelled to blog and broadcast my opinions all over the internet. I was so sure of myself and everything I wrote. I would read different books, or read articles, and then I would comment on anything and everything. I had these bizarrely confident viewpoints on things I had barely researched at all. I look back on it all with utter embarrassment. Now having earned graduate degrees in physics, even now, I’m extremely cautious when discussing topics. I know how hard it is to know something. It takes years, sometimes up to a decade. Knowledge is not cheap. You have to work for it, and make huge sacrifices for it. We live in an age where people feel the internet has all this great information. You can learn anything with a quick google search, so why do I have to go to college or a university to learn things? To that I’ll say this. The internet does contain a lot of information, but it also contains a lot of garbage. Do you know enough to sift through it? How does one go about doing that? You have to learn how to think critically. You can’t believe the first thing you hear. You have to learn the importance of doubting things. You have to learn to question things. You have to become self-aware enough to say to yourself, “How much time I have I spent studying this subject area? Do I really know what I’m talking about?” You dig and dig and keep digging. It’s hard work. You have to really be interested in that question to have the dedication to really learn about it. For these reasons I find I learn more by self-study than I do getting involved in debates online. I get online and research books on the topic, go on Amazon.com, order a big pile of books, and then sit and read them all. Then those books tend to lead to other books, which I further buy, and I keep reading, and keep studying. And typically, the more I learn, the more I question all the things I thought I once knew. I’ll say this. When I was a young teenager, I was a devout, super religious Christian. Then I went through my twenties, and I was this agnostic rationalist, all about science and reason. And I kept studying and studying. Learning more and more, and as I said, I even earned my degrees in physics. Then I sort of got to the end of that road, to the cutting edge, and was like, wow, this is strange. Looking at cutting edge cosmology, the fundamentals of quantum theory, and the rest of it. It was just all bizarre. And then I even got to studying even stranger books. Near death experiences, hypnotic regression, the nature of consciousness, and other things. Then around the age of thirty-five or so, I’m thinking to myself, materialist views of nature seem to be lacking, and there seems to be some bizarre evidence that consciousness may operate even outside of brain processes, such as these near death experiences and other phenomenon, but heck if I deeply understand any of this! Then I’m thinking, you know what, those religious folks talking about spirits, and God, and the rest of it, there could be something to all that. You have to be open-minded, but also critical, and just keep investigating everything. Keep digging. Keep learning. It’s a long process, and before long you’ll be on a road all by yourself. That’s because few people venture off the main road, the already beaten paths. In doing so you may receive ridicule from peers, friends, or family members. But go where the information takes you. Go where the facts take you. If you’ve been spending years deeply investigating something, chances are nobody else has investigated the subject as deeply as you have, so go where the information is taking you. You may be led to unorthodox, bizarre conclusions as well. Don’t be afraid to go there. Keep going.